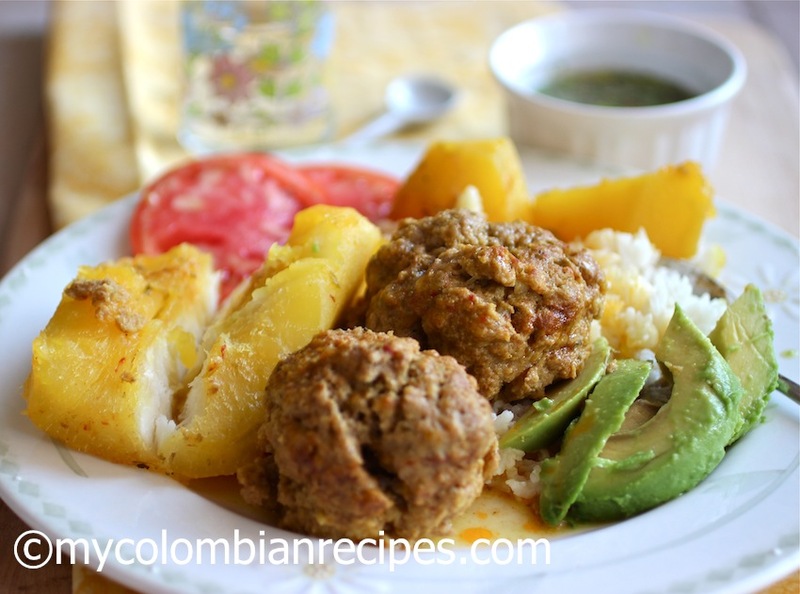 Sudado is a very common dish in Colombia. You can also make sudado with chicken, beef or pork instead of meatballs. 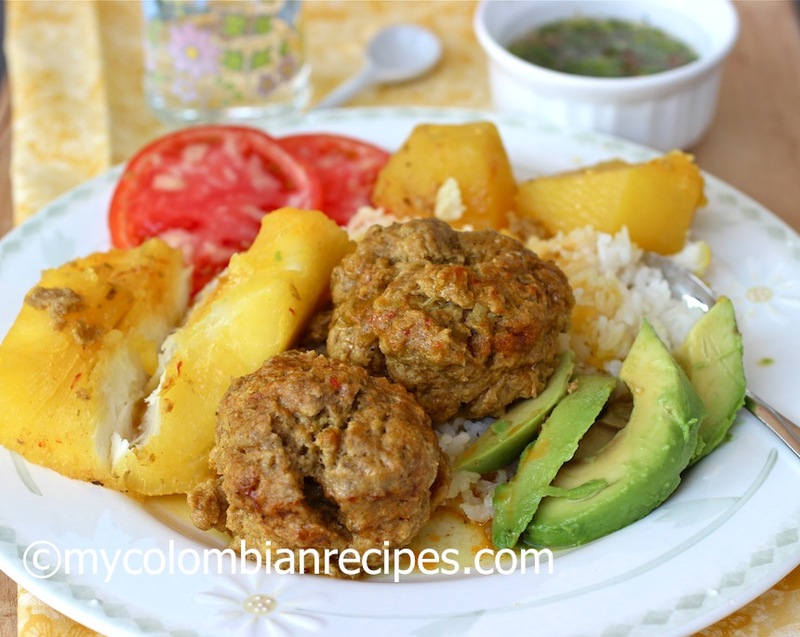 My grandmother made this Sudado de Albóndigas at least once a week. 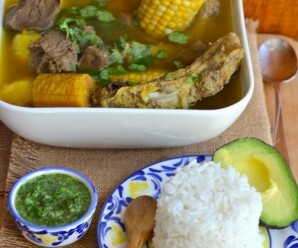 When you talk about something that’s truly Colombian, there is nothing more typical than “sudado” or stew. We serve Colombian Sudados over white rice. In a large bowl, combine the beef, pork, aliños, salt, cornmeal and water. Knead with your hands until well mixed. Shape the mixture into 8 meatballs, set them on a plate. In a large pot, place the water, beef bouillon, meatballs, aliños, salt and sazon Goya; simmer over low heat, covered about 40 minutes. Add the potatoes and yuca. Then cover and cook for an additional 35 minutes, until the potatoes and yuca are tender. Check frequently and add additional water as necessary. 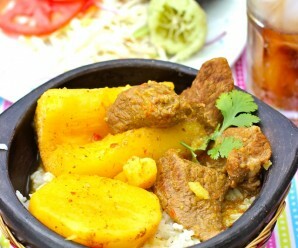 Uncover, check to see if the potatoes and yuca are tender, add chopped fresh cilantro, and serve over white rice. I made this and it was delicious. I love it. Thank you! We had this for dinner last night and my husband liked it very much. Thanks. This taste like my abuelita’s dish. Delicious and simple to make.Better the next day. Thank you. I made this last night….and it was INCREDIBLE. Thank you so much for posting these recipies……they remind me so such of my childhood. My daughter LOVED it. Thank you! Muchas gracias por la receta, todo sabia super rico, aunque se me deshicieron las albondigas y como mi esposo es quien cocina mas que yo, el me dijo que a la mezcla le debi haber agregado un huevo para que se pegaran y tambien las debi haber salteado un poquito en aceite para que se doraran por fuera. Anonymous- Yo nunca le pongo huevo a las albondigas en este plato y me salen bien, pero tu esposo tiene la razon el huevo las amarra un poco. My grandmother used to make this dish all the time. This blog brings back memories of my childhood in Colombia, specially the empanadas and the perritos calientes!!! I am very excited to start cooking Colombian food !!! I was looking for this recipe! thank you for this blog and I wish you the best for your family, félicitations as we say in France! merci! I made this suado de Albondigas and it was delicious. This sudado was a huge hit at home. I made it last week and the only thing I changed was to make a bit more meatballs to have leftovers for lunch the next day. It is delicious as is! Thanks again Erica for all your recipes. Esta receta era fabulosa. Muchas gracias! This was truly delicious. I made this recipe tonight. Turned out delicious!! When I was cooking the stew, after 40 minutes I realized I put way too much water because it looked too soupy. I ended up putting the meatballs to cook in some olive oil to get some color and the potatoes around the rim. I also softened some carrot and put it in the stew. Very yummy!! The excess liquid was used to put over the meatballs while in the pan to keep them juicy and aswell as when I served. 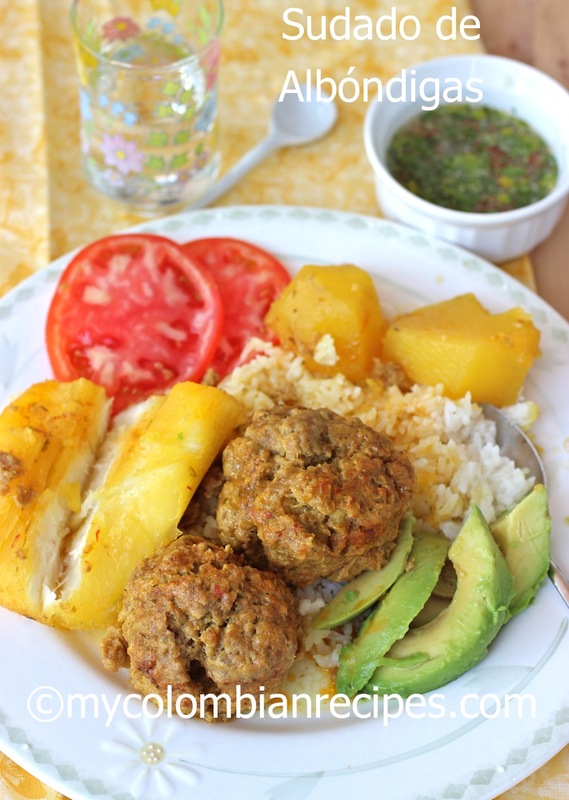 I made this sudado yesterday for lunch and it was fantastic….I have some left for today. Delicious. Made this one and it was delicious. Wow!i just finished making this! 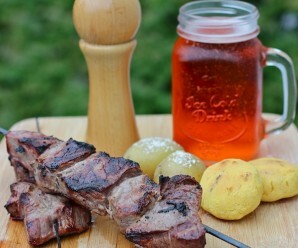 And its so good, lots of flavor and everything is so tender and juicy, can’t wait to have it for lunch tomorrow!! I made this meatballs stew last night for dinner and it was fantastic. So good. Erica, se ve fabuloso ese sudado… riquisimo espero que muchas personas lo disfruten si lo hacen como nosotros tu sabes, Muchas saludes de todos nosotros, tú familia. 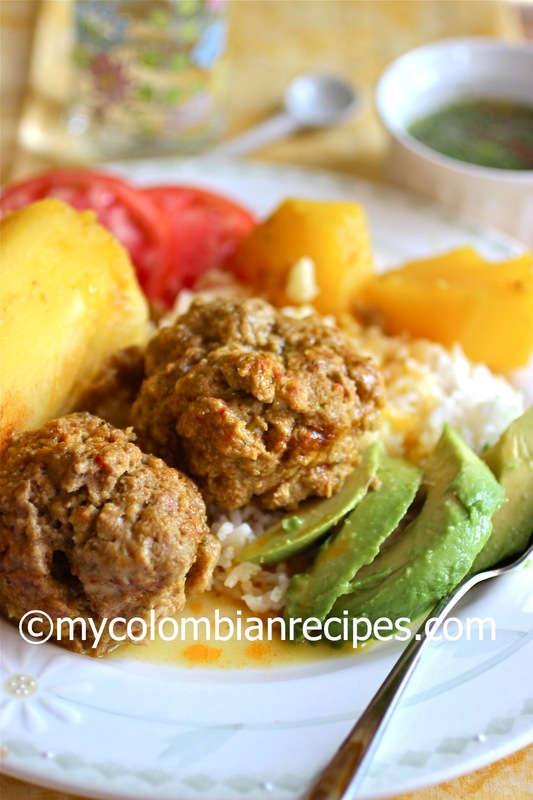 This sudado de albondigas recipe is super easy and simple and yet extremely rewarding! Fantastic flavor!Thanks! Thank you for all these wonderful recipes. When I make them , they come out just like the ones we used to eat , great job! When is your book coming out, please let me know. This is my second time doing this sudado with your recipe. It’s delicious. Thanks for sharing. I did not add the whole 1/2 Tbsp of sazon goya with azafran to the stew because is too much and I dont like the color, but other than that…. is perfect and my Puerto Rican husband loves it. 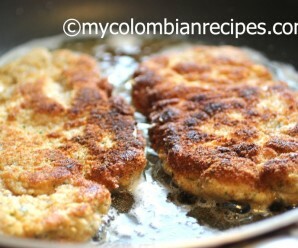 I am Colombian and learn to cook from my mom but I still refer to your page for recipes all the time. Hola;yo te sigo por medio de pinterest pero todo es en ingles; la verdad sigo tu página hace mucho pero en la app no puedo, no entiendo mucho, agradecería si pudieras ponerlo en los dos idiomas, así quienes no hablamos inglés podemos entender más y hacer las resetas; gracias por darnos tu conocimiento a quienes somos colombianas y no sabemos cocinar mucha variedad; yo estoy contenta con el contenido; solamente pediría que en la app fuese de ambos idiomas.